With National Sleep Awareness Week being this week (March 2–8) and the daylight savings time change coming up (we lose an hour of sleep on Sunday, March 8), now is the perfect time of year to think about getting some quality shut-eye. How can you sleep better? 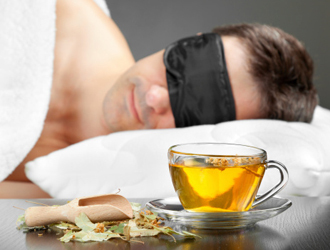 By studying your current habits and implementing these natural remedies for better sleep. What Are Your Nighttime Habits? My friend Chris is a self-proclaimed “night owl.” He stays up late to watch all the nightly talk shows, especially the Late Show With David Letterman. His head probably hits the pillow around 1:30 or 2:00 a.m., and after tossing and turning for a half-hour, he finally falls asleep. But he’s not fast asleep, and he gets up a couple times throughout the night, before beginning his day at 5:30 a.m. Needless to say, Chris is not rested, nor does he want to get out of bed. Throughout his day, he’s tired, anxious, easily irritated, and often depressed. But this has been his routine every night for 15 years. Chris is not alone with his sleep troubles. Insomnia and other sleep disorders are a silent epidemic. In fact, every year, around 60 million Americans suffer from insomnia and sleep problems. Now, Chris knows his sleep is important, and asking me for advice was a good first step. Many people have difficulty sleeping, yet they fail to discuss the issue with their doctor. Chris also complains of fatigue, anxiety, depression, and irritability. I told Chris that without sufficient sleep, he could be at risk of other serious health conditions, such as diabetes, obesity, hypertension, heart disease, suppressed immunity and libido, and cancer. It is best to consume herbal and caffeine-free teas before bedtime, and chamomile tea should top your list. Chamomile has been considered a gentle sedative, mild tranquillizer, and sleep-inducer for centuries. The essential oil is also widely used within aromatherapy. There is also some supportive scientific evidence for chamomile. A randomized, double-blind, placebo-controlled study from 2011 found chamomile provided modest benefits in 34 adults with chronic insomnia. Another study from Japanese researchers in 2006 found that chamomile extract helped rats fall asleep as fast as the tranquilizer drug benzodiazepine. Chamomile’s sedative effects may be from the flavonoid apigenin, which binds to brain receptors. More studies are likely needed on chamomile’s sleep-inducing properties; however, millions of people have been falling asleep with it, and they likely don’t need evidence to support that fact. You can purchase chamomile tea bags in most natural health and grocery stores, or you can dry and brew German chamomile flowers yourself. Pills before bed may not be your thing; maybe you’re looking for something more natural. So instead of prescription pills, try a magnesium and calcium combination supplement powder to help you sleep soundly. People who get up throughout the night often have calcium and magnesium deficiencies. Calcium will team up with the amino acid tryptophan in the brain to produce the common sleep-inducer, melatonin. Magnesium also plays a key role in sleep regulation. GABA (gamma-aminobutyric acid) is considered a calming neurotransmitter that is needed for the brain to rest at night; magnesium is required for the proper functioning of GABA receptors. Alone, magnesium and calcium are effective sleep inducers, but together, they are even more potent. Plus, by taking a combination of the two, you can avoid potential heart complications from taking calcium supplements alone. Valerian root is excellent to induce relaxation and calm you down after a stressful day. In fact, it has been used as a mild sedative for centuries in Chinese, Greek, Indian, and Roman cultures. Valerian root may also increase GABA and improve sleep quality. There is also evidence that suggests that valerian root helps relieve insomnia. In fact, I recall a randomized, double-blind, placebo-controlled, crossover study published in the journal Pharmacopsychiatry in 2000. During the two-week study, valerian root positively improved sleep in 16 patients with insomnia. Valerian is available in root form, but can also be purchased as a tea, tincture, fluid extract, and powdered extract. Other possible herbal nighttime formulas may include skullcap, passionflower, lavender, lemon balm, St. John’s wort, hops, or California poppy. Try a few light yoga poses, like “child’s pose” or “legs-up-the wall.” They will help you fall asleep and relax at night. Remove all electronic devices from your bedroom. Why? The electromagnetic frequencies (EMF) may leave you counting sheep. Try some other good sleep-inducing supplements like melatonin, kava kava, 5-hydroxytryptophan, and the amino acid theanine. Consider homeopathic natural sleep remedies, including coffea cruda, chamomilla, gelsemium, and passiflora. We might be losing an hour of sleep come Sunday; however, there are several natural sleep remedies that can help you get into a healthy sleeping pattern and keep you well rested year-round. But like all remedies, both natural and prescription, it is recommended that you discuss these natural remedies with your doctor before making any changes. Murray, M., et al., The Encyclopedia of Natural Medicine (New York: Atria Paperback, 2012), 597, 639–642, 748–756. Srivastava, J., et al., “Chamomile: A herbal medicine of the past with bright future,” Molecular Medicine Report November 1, 2010; 3(6): 895–901, doi: 10.3892/mmr.2010.377. Shinomiya, K., et al., “Hypnotic activities of chamomile and passiflora extracts in sleep-disturbed rats,” Biological & Pharmaceutical Bulletin May 2005; 28(5): 808–810. Zick, S., et al., “Preliminary examination of the efficacy and safety of a standardized chamomile extract for chronic primary insomnia: A randomized placebo-controlled pilot study,” BMC Complementary & Alternative Medicine 2011; 11: 78, doi: 10.1186/1472-6882-11-78. Doyle, M., “Help Me Sleep: Magnesium Is the Secret for Sleep Problems,” HuffPost Lifestyle web site, May 22, 2013; http://www.huffingtonpost.co.uk/marek-doyle/help-me-sleep-magnesium-secret-to-sleep-problems_b_3311795.html, last accessed March 2, 2015. “Understanding the Side Effects of Sleeping Pills,” WebMD web site; http://www.webmd.com/sleep-disorders/guide/understanding-the-side-effects-of-sleeping-pills, last accessed March 2, 2015. “Insomnia Symptoms,” Mayo Clinic web site; http://www.mayoclinic.org/diseases-conditions/insomnia/basics/symptoms/con-20024293, last accessed March 2, 2015. “Insomnia: Studies Suggest Calcium And Magnesium Effective,” Medical News Today web site, September. 8, 2009; http://www.medicalnewstoday.com/releases/163169.php, last accessed March 2, 2015. Donath, F., et al., “Critical evaluation of the effect of valerian extract on sleep structure and sleep quality,” Pharmacopsychiatry March 2000; 33(2): 47–53.